This Is What a Happy Pig Looks Like! Why is he so happy? He’s been allowed, since birth, to do what pigs love to do: drink mamma’s milk, roll around in the mud, root up all sorts of goodies to eat, snuggle with all his brothers and sisters in the shade of a big ol’ tree, and indulge his natural curiosity. Before we go much further here, a note to the vegetarians: I know you don’t like the idea of eating a pig, and you may want to rage against me for even talking about it; however, this pig WOULD NOT EXIST if it weren’t for us pork lovers. So take a deep breath and please let me continue with this story in peace… Thank you. 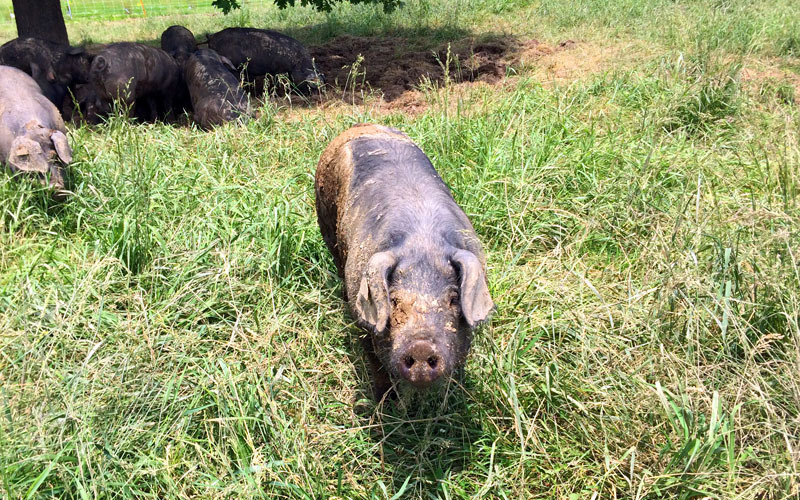 Farmers take note: There is an insatiable unmet demand for organic pigs in America! Chipotle alone would buy them all. From what I understand from the Rodale Institute (which is happy to help you get started), organic pigs are fairly easy to care for. The biggest danger is they love to untie your shoes. Now, these pigs are especially happy and lucky because if they have a problem, they have a vet who treats them with homeopathic medicines. Seriously, Mamma Pig had a back pain from making babies with Papa Pig, and a round of acupuncture did the trick! They are so happy that I have seen them roll over for their tummies to be rubbed by the friendly people who take care of them. I’m happy for them. I’m also happy that I will get to eat them. Not a lot, just a little. There will be plenty to go around. Most of all I’m happy to know, and show you, that it’s totally possible to raise healthy happy pigs both humanely and organically. All we need is more farmers to start doing it. Lost in Transition: Why Are Farmers Resistant to Organic? 11 Responses to This Is What a Happy Pig Looks Like! How about just letting them continue to be happy for the entirety of their natural lifespan? Too much to ask, I know, but I am sure that the meat taste much, much better than their counterparts who are not treated as humanely. I am pleased that the experiment is taking place at The Rodale Institute, and not some farm somewhere with a farmer that doesn’t know much about pigs. Belly rubs? Try giving them massages and beer like the Japanese do to their cows to get great Kobe beef! I’m sure the pigs will love it, and their masseur/masseuse will get a kick out of it also! Maybe they could have a piggy happy hour together! Good eating! Well, I am a vegetarian, don’t eat meat, fish or fowl. But, if I were a pig, I would love to live at your pig farm. Sounds very healthy and lots of fun! I hope anyone who wants to raise pigs will get the training and information they need from Rodale!! Thanks for spreading the word. I was fortunate to experience a very happy pig, growing up on farm I had opportunity to play with them on open fields, wach them baskin in a sun and rolling in a mud. I wish that all pigs have life like that. Thank you so much Patty, Zorica, Alice and Donna….we do all know each other as friends and sisters! Everything is connected, after all. And I do appreciate all your kind words. way they live in factory farms). I also chose to eat range/cage free chickens and eggs fifteen years ago. I agree with Maria, that more farmers should go organic, free range, etc., Let’s support the farmers who do! I would like to start a vegetarian diet but don’t know where to start. Any suggestions? 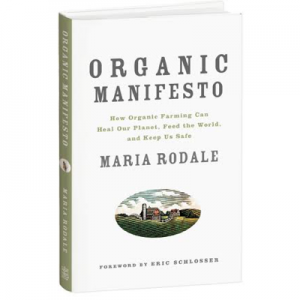 Hi Patti, Rodale has a lot of resources on eating a vegetarian diet! 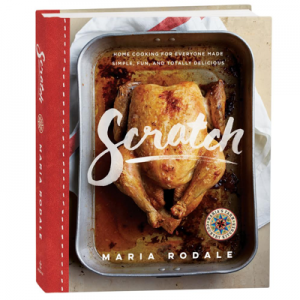 We have a new book our that makes vegetarian cooking easy: http://www.rodaleinc.com/products/books/simple-art-vegetarian-cooking-templates-and-lessons-making-delicious-meatless-meals-every-day And Prevention and Women’s Health have a lot of info on vegetarianism as well! Good luck, and just make sure to get enough protein, vitamins and minerals! I was an environmentalist back in the late 70’s when pigs were raised on the ground in many locations in north Alabama. The pigs would always go to the lowest wettest part of the field to root out a wallow. Often this was close to a stream or other water body. Rain would wash the feces, pathogens, rooted up sediment, etc. right into the waterway, then right on down to the next drinking water supply. We do NOT need to return to this!!! If enough organic pork to feed us all is going to be raised on the ground, it is not the lesser of the two evils. I still remember the ’70’s and why we got the hogs off the ground and onto a concrete floor. It gives me hope for the human race to know there are people like you on the planet! It seems to me that you practice the Golden Rule and if everyone would treat others as they would like to be treated,we would have NO PROBLEMS in the world. Keep up the good work,PLEASE!